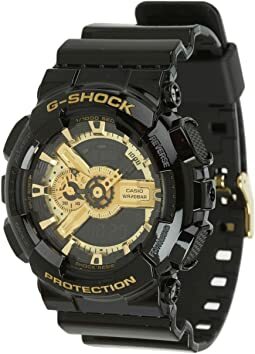 G-Shock watches have shattered the notion that a watch is a fragile piece of jewelry, and should be handled with care. Designed to resist practically everything, G-Shock watches offer extreme durability and remain unaffected by strong impacts or shaking. By always employing the latest technology, G-Shock continues to transcend conventional thinking about the everyday watch. 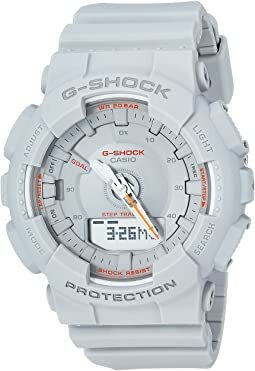 Two engineers, with a vision to create the ultimate watch which would then become the G-Shock, assembled a rogue team and named their mission, “Project Tough.” Through perseverance and unusual testing methods, such as throwing prototypes out the second floor bathroom window to the asphalt below, they developed the first G-Shock watch in 1983. 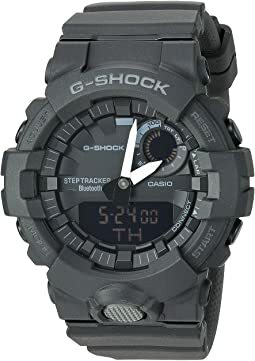 This watch was able to withstand their then benchmark of “Triple Ten” criteria, namely 10 years of usage, 10 atmospheres (water resistance) and a 10m fall (shock resistance). Today more than two decades later, G-Shock watches have exceeded the designers’ original benchmark and pushed the limits of what a watch can endure. 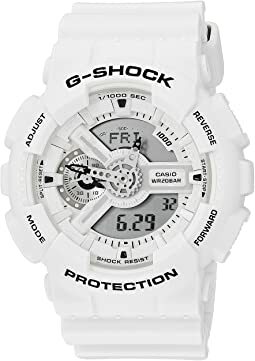 With 200M water resistance & shock resistance at the heart G-Shock’s strength and numerous technological advances such as Tough Solar Power and Atomic Timekeeping, you’ll have no doubt why G-Shock is called the Toughest Watch in the World. Can't go wrong with a G-shock. My husband loved it and wares it everywhere he even showers with t since it’s waterproof! Best watch I've ever had. Fantastic price, comfortable, stylish, just overall a great watch. G-Shock is the way to go!! I love this watch. It's made well, comfortable to wear, looks great, sporty and masculine, and reasonably priced. 4 stars overall. The missing 1 star is because: 1) Watch beeps at 2:25am and pm every day and I cannot figure out how to silence this. 2). Despite how many times you set the watch, it will never sync properly with the day of the week. I wore this watch in 3 different countries and it never worked properly in this sense. Otherwise, the watch is lightweight, very comfortable, and looks nice on the wrist for sports/casual wear. Great price. And it is waterproof. Loved the watch and the color, unfortunately the watch was not working and I wasn't about to spend $130.00 on a watch and then go find batteries for it. I sent it back the next day. 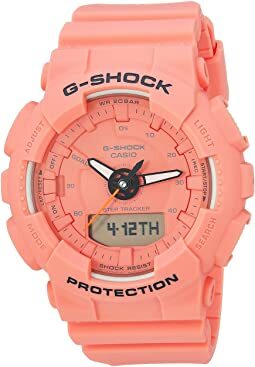 I bought this watch for my 14 year old Son. He loves it. It can endure the daily lifestyle of a highschool teenager for sure. Got this for my husband as a gift. He's not a huge watch person but needed one for the gym to track between sets and it's perfect for just that. 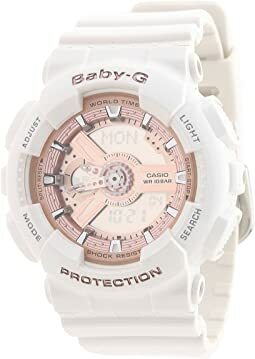 I was looking for a Baby G watch for my 11 year old grandson. He is thrilled about the one that he expects this Christmas. My husband bought this for me as a surprise gift! And I absolutely love it! It's a little bigger than what I'm use to but it still looks very good on! This was a gift for my husband and he loves it! He needed something rugged that he could wear to work (crane operator), on the bike and on the boat that would be okay in the water. 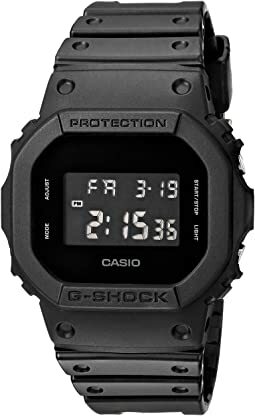 This watch has that all covered and it looks really cool too, especially with the black on black. Our teenage daughter helped pick it out, she thought it was the coolest watch ever so it scores style points with the younger crowd too...the younger than us crowd. Hubby says it's comfortable and easy to navigate. You can't go wrong with this bad boy. 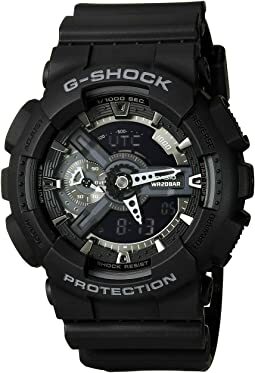 Another great addition to the g shock line. 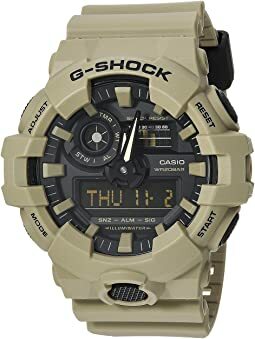 I already own many a g shock and when I saw this one I just had to have it. Very rugged build as usual and perfect for pretty much any activity you can throw at it. I bought this for my 15 year old son. He has two other G-Shocks and loves this one. Very stylish, not too complicated but still interesting. All his friends want it! 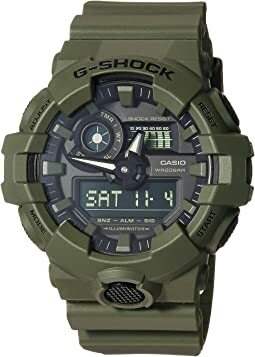 Bought this for my 13 year old nephew who wanted a cool military style watch. He loved it - it works great and is very stylish. Nice construction, good watch. This is the second one I've bought and was happy with both. Love the watch! Fast shipping, price not too bad! Only bad thing about watch is the light. When you turn the light on it only shows the time but barely. But still would buy the watch; it's a great product! This is a great watch. I have had it for a month now. I like the size and weight of it. The color of black and grey is more accurately described as a dark grey and light grey. Only downside I have found is the light when used at night is only good enough to see the time. Not bright enough to see digital displays. So make sure you set your alarm prior to the darkness if you are out camping. Overall great watch and great price. Good watch. Had it a month - a thousand compliments. 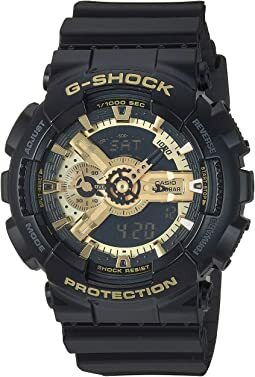 Looks great, good price, goes with everything and I always know what time it is. Just wish the back light was cooler and the battery lasted longer. Got the watch as a weekender when I'm running around with my nephews since I'm always getting my fancy watches scratched up - best idea ever - been on two getaways since I got the watch with heavy usage (running into things, swimming, wearing the watch all day and night) and it's been great - somewhat easy to use - took me a minute to figure out the ins and outs but simple once you get the hang of all the features. 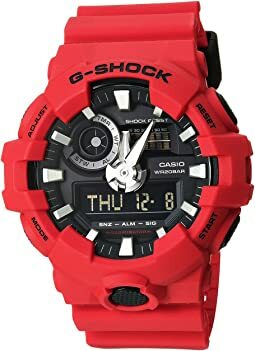 great basic style, nothing too flashy fits on my wrist well and is sturdy - and has a great weight - not too heavy but not so light that I feel like my wrist is bare. if you're wavering on a G-shock... just get it - great watch. And Zappos is effin awesome when it comes to customer service so it's win/win great product, great service - no brainer. Overall, my hubby loves this watch. I'm not sure if Zappos mistakenly shipped the wrong watch, or the color just appeared to be black online. But when we received the item, it was clearly gray in color. It was for my hubby's birthday & I rushed to another town to buy it in black (since I wanted it to be right for his surprise birthday party). As far as the watch goes, my husband loves it. He says it's comfortable & obviously very stylish. He gets a lot of complements on it & is every bit worth the price. We didn't have to return the gray one because my dad loved it so much as well. 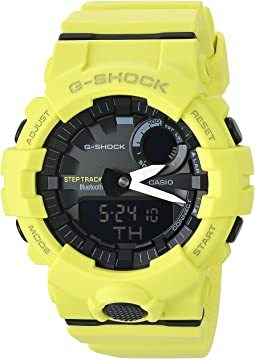 Super cool watch at a great price! Love this watch. Had it for 3 days now and I think it looks great. 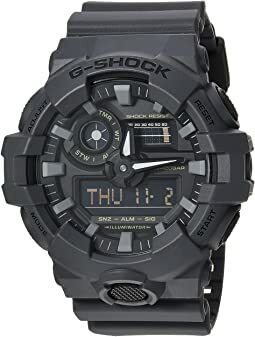 I just returned the G-Shock X-Large GA100 as I didn't like the white hands on the black face. This watch is charcoal grey band and case with grey and white hands on a grey analog/digital face. Looks a lot better as it is not such a stark contrast. This is also easier to read in the dark as the light isn't like a timex indiglo, but a projected led. It lights up the whole face enough to tell the time and even read the date in the digital portion. 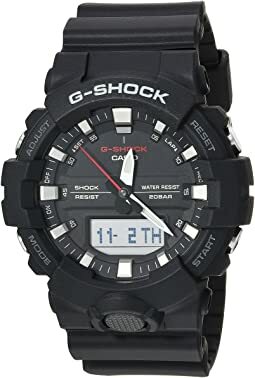 This is my second G-Shock and I am sure if I can find others as cool looking as this one, I will expand the collection. 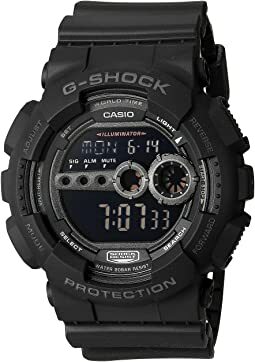 I bought this watch a week ago and wow it is awesome it is durable and looks awesome I have had many other watches including other G-Shocks and this is by far my favorite I like it better than my Diesel and even my expensive Movado! I get compliments every time I wear it. Thank you, Casio! Light weight. Looks really good! Received the wrong item in the box from the manufacturer and Zappos exchanged and overnighted a replacement right way. Best customer service in America. I buy stuff here not because of price but because of excellent customer service and quality.